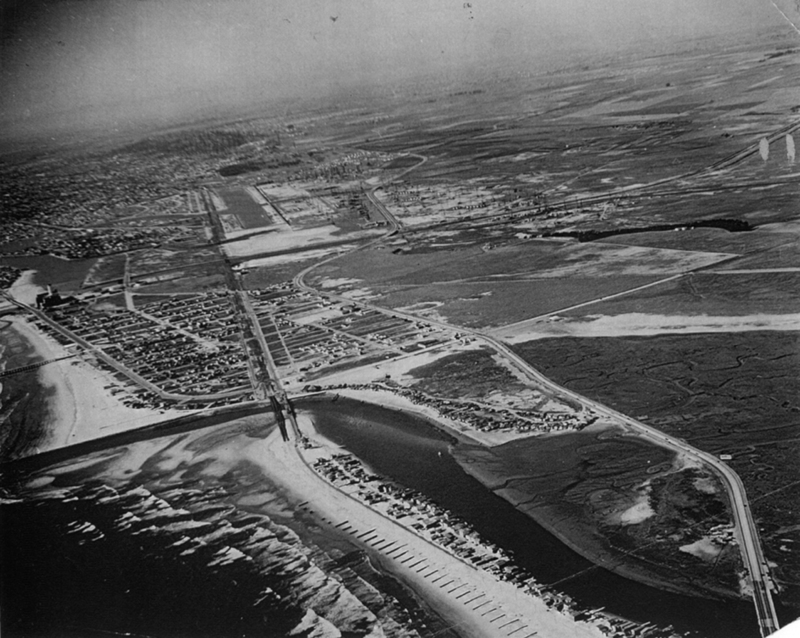 Here’s a nice long view of Seal Beach looking north in 1938. You can see the homes and buildings of Anaheim Landing six years before the Naval Depot takes over the land and Anaheim Bay. The Pacific Electric red car line runs through Anaheim Landing, up through Seal Beach on Electric Avenue, across Alamitos Bay to Appian Way where it runs parallel to the Long Beach Marine Stadium built for the 1932 Olympic rowing competition. You can see the shorter stack power plant along the San Gabriel river. Bridgeport and The Hill have yet to be developed. The Long Beach Marina hasn’t been dredged. McGaugh School isn’t even in the planning stages at this point. Be sure to check back each week for more historical photos and stories of Seal Beach. This entry was posted in Seal Beach History and tagged 1938, Alamitos Bay, Anaheim Bay, Anaheim Landing, DWP, Long Beach, Long Beach Marine Stadium, Pacific Electric, Red Car, Seal Beach. Bookmark the permalink. The roller coaster (The Derby) is no longer there. Dismantled after the earthquake? The roller coaster survived the Long Beach earthquake, but it couldn’t survive the Great Depression and bankruptcy. On 12/17/1935, the roller coaster is still standing in an aerial shot. By 11/11/1936, another aerial photo shows the roller coaster, the pavilion, and the Jewel City Cafe building are all gone.